When Kevin Currie transitioned from Emory College of Arts and Sciences into the Nell Hodgson Woodruff School of Nursing, faculty and staff were prepared to welcome a values-centered leader. What they could not have anticipated is just how much his commitment to advancing leadership, social responsibility and diversity through service, scholarship and practice would positively affect their classrooms, his fellow classmates and the nursing profession as a whole. Grounded in a commitment to excellence that began when he was a student in Emory College, Currie continued to excel as leader, scholar, nurse scientist and champion for vulnerable populations as a nursing student. His dedication to both the university and the School of Nursing is unparalleled. As a student at Emory College, he was both an athlete and board member for the water polo team. He also hosted a radio program on Emory’s campus station, WMRE. At the School of Nursing, Currie organized the re-chartering of the school’s chapter of the American Assembly for Men in Nursing, where he was also a member of the board. Currie demonstrated his commitment to protecting the health and dignity of vulnerable populations, as a scholar of both the Veterans Affairs Nursing Academic Partnership (VANAP) and the Building Nursing’s Diverse Leadership at Emory (BUNDLE) programs. The VANAP program prepares students to provide veteran-centered care, while the BUNDLE program fosters leadership and diversity. He was selected to participate in the Emory Scholars program, where he represented the School of Nursing in a health policy immersion on Capitol Hill. During the program, he met with Georgia’s elected officials and raised awareness of the scope of practice barriers and a proposed amendment to the U.S. Department of Veterans Affairs' (VA) medical regulations that would enable advanced-practice registered nurses to practice to the full extent of their education, training and certification within the VA’s more than 1,700 hospitals, clinics and veterans centers. Currie models by example Emory’s values of leadership, scholarship and service. 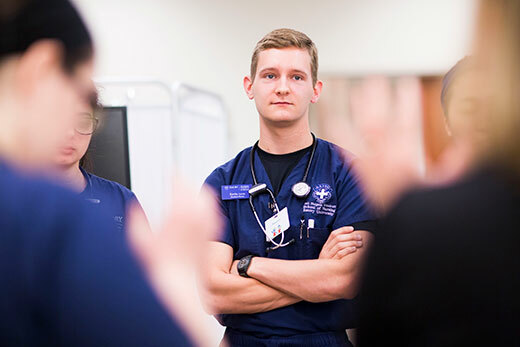 He will graduate May 8 with high honors from the School of Nursing and will begin a very promising career in the field of emergency nursing. With Commencement nearing, Currie took time to discuss what drew him to nursing school and his plans for the future. What made you decide to pursue a career in nursing? As a kid, I had always liked math and science and had an inclination to work in the medical field. During my freshman year of high school, a nurse told me about the endless opportunities in nursing and the need for more men in the profession. After doing some quick research about the profession, I became convinced that nursing was right for me and I never turned back. Nursing is exciting because I get to directly see the benefit of all the applied science in health care that saves lives. It is hard for me to imagine a profession that would be more personally rewarding because nurses have the privilege to help and advocate for patients and families during some of the most stressful moments of their lives. Because I was able to participate in Emory’s Veterans Affairs Nursing Academic Partnership, many of the patients in my clinical experiences involved veterans. Being able to help this deserving population and listen to their countless stories was rewarding on a weekly basis; however, there is one particularly rewarding situation that stands out to me. Over the summer, I was working in the Surgical Intensive Care Unit at the Atlanta Veterans’ Affairs Medical Center and was assigned to help care for a very medically unstable patient. Toward the end of the 12-hour shift, the patient started to decline very rapidly. I noticed some of the warning signs in the patient and alerted my nurse preceptor to come help. Within seconds of my preceptor arriving, our patient went into respiratory arrest and we summoned the hospital’s response team that was able to help save the patient. The realization that I was able to rapidly assess the patient and act appropriately to help save the patient’s life was the most rewarding and encouraging moment of nursing school. I’ll be moving back to my hometown of Nashville, Tennessee, to work at Vanderbilt University Medical Center in the trauma ICU as part of the Nurse Residency Program. After a few years on the job, I hope to go back to school to pursue a doctorate in nurse anesthesia.